It only took me two years, but I finally finished spinning the singles from this half silk brick from Northeast Fiber Arts Center. I bought the half silk brick at SOAR in 2011. 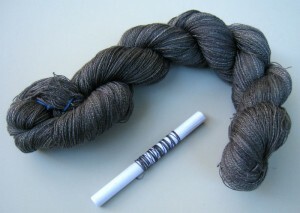 At that SOAR, I also purchased a Golding Micro Spindle. I immediately started to spin it. As happens to all travel projects, they get very little love when you aren’t traveling. I brought it along to SOAR this year. I didn’t bring a spinning wheel this time so the spindle is what I had. I finally finished spinning the singles at the Spin-In on the last evening. Over the weekend, I finished plying the singles on my Matchless. After a long soak in hot tap water, per John’s instructions, I hung it up to dry. 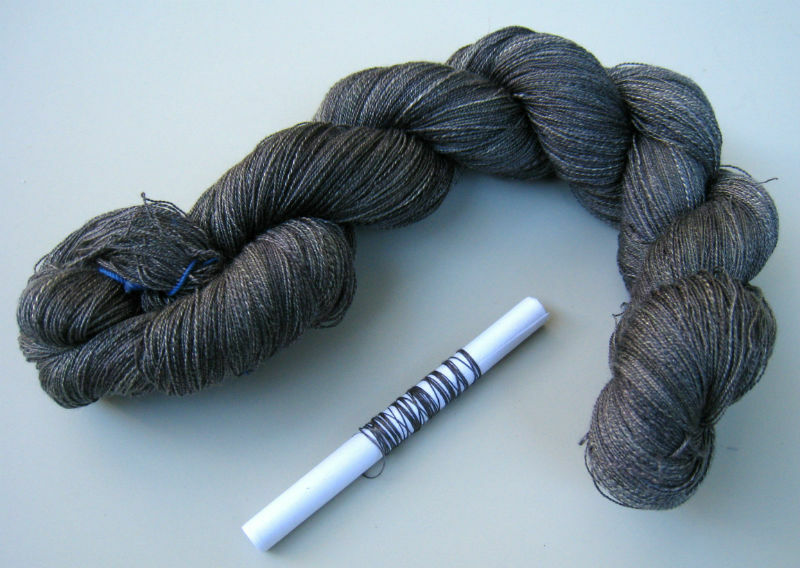 I squeezed out excess water with my hands and snapped the skein a bit to straighten it out. I then let the weight of the wet silk keep the silk “weighted” until it dried. And, yes! After plying, what you see on the paper quill is all that remains of the singles. There’s probably a couple of yards left. I couldn’t be happier! The color is really subtle. The overall color is a dark grey but there are bits of white and green in there. It looks a bit like a black beetle that shimmers in the sun. I’ve since started the other half brick I purchased to go with this. This one is sort of bronze with greens and reds. I hope it doesn’t take 2 more years before the singles are spun. I have plans for these two silks! Beautifully spun, Ann, amazing yardage.